Ship Watchers has the most advanced web portal in the industry that integrates all of your shipping characteristics into one online platform. With clients in mind, our team of former carrier employees, developers, and IT Professionals created a Network that streamlines all carrier data and processes into a single source. Utilizing our Advanced Reporting and Portal Access will give you insight on all your transportation spend so that you can make key operational decisions. Our user friendly web portal reporting interface enables you to build reports using over 300 fields and personalize your view. Whether using our basic reports or customized reporting through our development team, all reports have search, sort, print, and export capabilities in table and graphical formats. 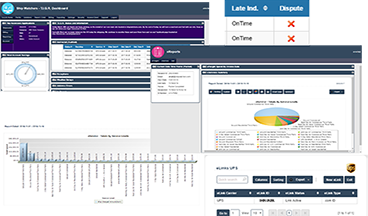 Our claims, dim weight, freight payment, address correction, unauthorized, and other dashboards that require client feedback incude the ability to edit, add, delete, and import creating an easy way to exchange information and keep data clean. Your more experienced level profiles can have direct access via MySQL program interface software. Your client account will be setup with direct access to table views in which you may create your own queries and reports based on the data provided by Ship Watchers. This is a “Sandbox” view and is not connected to the main data stored by Ship Watchers. Any changes in these tables will not impact your data housed for the auditing and portal access. Ship Watchers default reporting system provides invoice information as received and analyzed for auditing and payment. Initial viewing of all carrier data will be shown in the local currency and weight measure provided by the carrier invoice data whether this is US Dollar and Lbs. or Euros and Kgs. Clients have the option to customize this data for viewing by converting the currency to another currency and/or converting the unit of measure for reporting and summary reports. Please note that currency conversions are subject to change after pulled as exchange rates fluctuate frequently. Actual rate of conversion cannot be established until post payment and closed-loop billing has been completed to update all tables with actual information.